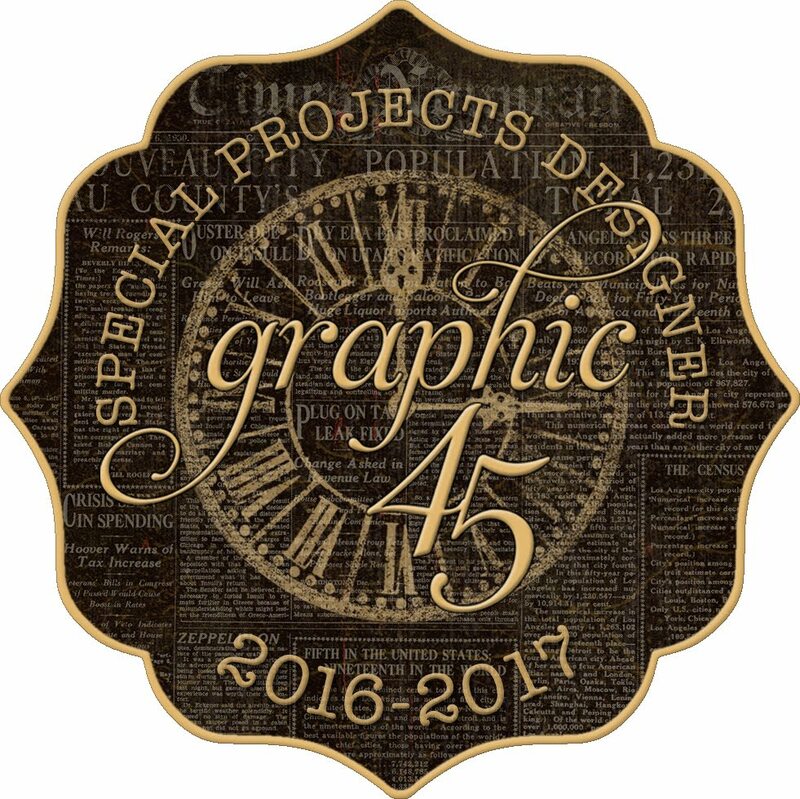 As I mentioned earlier in the week, Mary Werner was randomly selected as the winner of a personalized tag using her favorite Graphic 45 collection. She mentioned in her kind comment that Once Upon A Springtime had special meaning to her, not only from her own childhood, but as a grandmother as well. "I couldn't believe my eyes when I saw ny name as the winner! Such a happy day and getting your tag will be a really great treat. 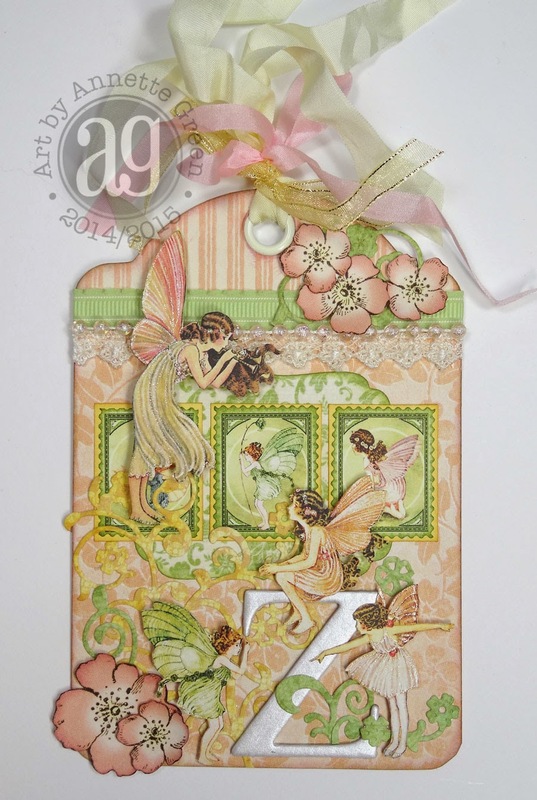 And getting your tag with Once Upon A Springtime will be magical. Zoe, my oldest granddaughter, is graduating high school this May. When she was very small and her mom was working (to get her PhD), we built a special bond together through fairies. She would sit in my lap as we looked out the window at the flower garden or sit in the swing and talk about the fairies that lived in the garden. 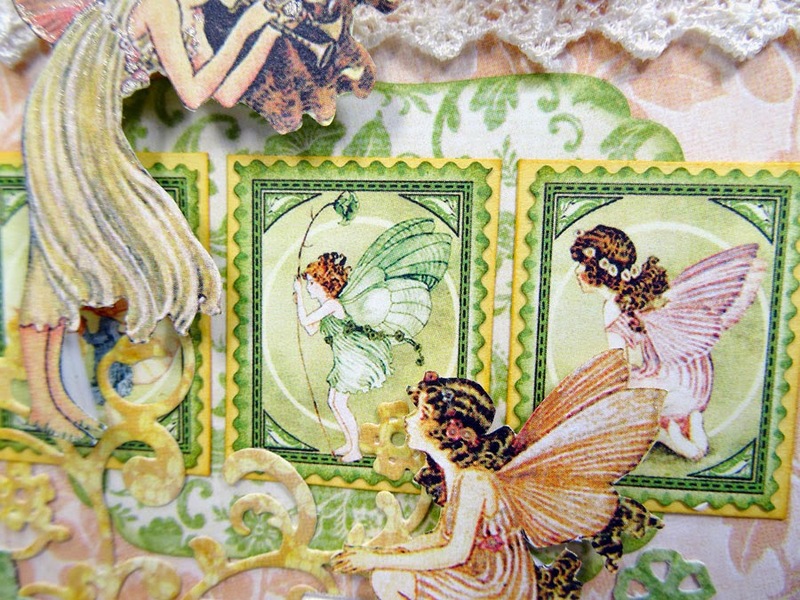 The fairies always had the same "issues" that she had during the day with sharing, not taking naps, arguing with a friend, etc. I would tell her stories about them (she named them all) and I think she learned lessons on how to handle situations through these stories, and I know she became very sympathetic to others in their actions and feelings. When she was just learning to write, she would leave notes for some of her favorite fairies, Indianna, Molly and Tom. They slept in the roses, would swing on the daisies, and splash each other with water from the tiny pond. In Kindergarten, she had to write a short story and it was about the fairies. When she left notes in the pot outside, I would replace them or add to them with a very short message written with a burnt stick (to make it more believable). 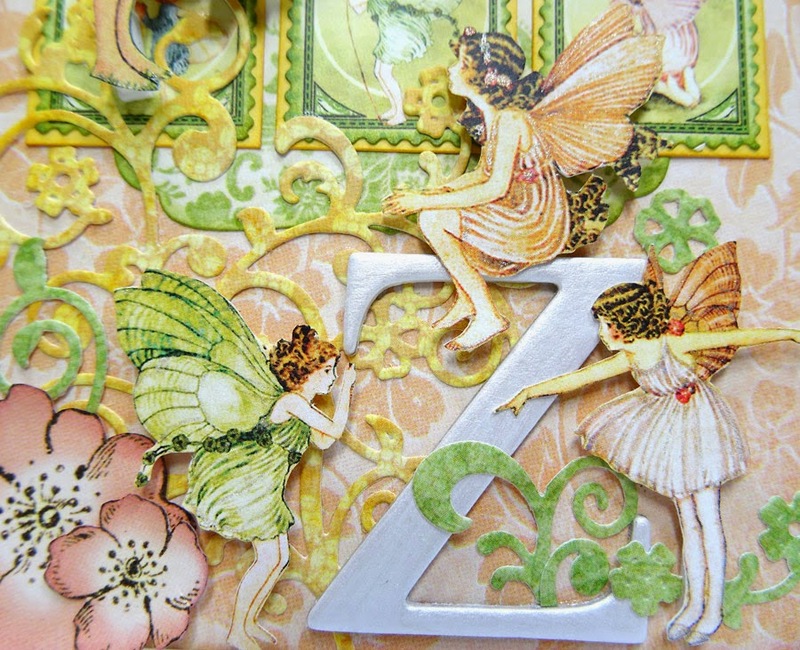 I have saved them all these years and made a special scrapbook for holding them and used Once Upon A Springtime. Your tag will go wonderfully with that project. I'm so very glad to have won this particular prize and especially from you, who can make colors dance and come alive!" Such an amazing, sweet story. It touched my heart so. I can just picture Mary (even though we've never met) and her little granddaughter sitting together in the sunshine, talking about the fairies, can't you? I had the most wonderful afternoon creating this special tag for Mary (but really for Zoe, thus the letter Z worked into the design). I put on Classical music for inspiration and got lost in the process, picturing the fairies floating around me as I worked. I certainly hope Mary enjoys it and so does Zoe. Congratulations once again Mary and thank YOU for the sweet story. The tag is in the mail! What a great story and memories for both Mary and Zoe. I know the tag will bring joy to both. You did a fabulous job creating it, Annette. I found Mary's story quite moving and really lovely at the same time! Your tag for Zoe is absolutely stunning! Oh Annette the tag is wonderful. It is full of the tiny fairies that mean so much to both Zoe and me. Thank you so much for such a beautiful tag and for taking the time to make it extra special with the Z. She loves it and we couldn't be happier!! 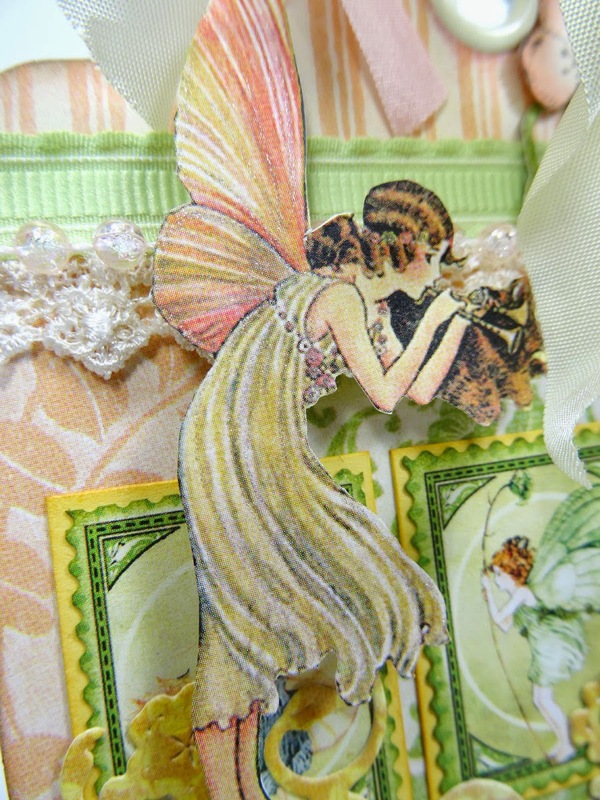 I can't wait to get it and attach it to the fairy box of notes. This is a very good day! I'm so glad to hear that Mary won the tag. What a wonderful story about her and her granddaughter! After reading this and seeing the spectacular tag that you made for her, I love the paper collection even more than I did before. :) (I really liked it, definitely one of my all time favs.) Congrats Mary, Congrats Zoe on your soon to be graduation and congrats Annette on making such a beautiful tag.